Yesterday, we wrote about how mobile phone manufacturers performed. Today we thought we take a look at OS market shares, check the US market and also Microsoft's standing before Windows Phone 7, at least a look through the eyes of the analysts at Canalys. The US market is pretty clear cut - 94% of the smartphone market there are either Android phones (43.6% in total), iPhones (26.2%) or BlackBerry (24.2%). 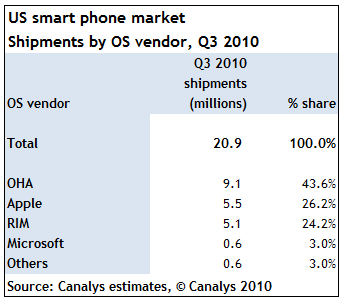 Microsoft's Windows Mobile is holding a tiny 3% share and all other OSes cover the last 3%. Windows Phone 7 devices just started selling last month so there wasn't enough time for them to have much of an impact. But when the Q4 results come out it would be interesting to see how much ground Redmond has gained on the mobile OS playing field. Google called Android its best deal ever - and we can see why. Compared to Q3 of 2009, Android has grown 1,309% - yes, over a thousand percent - worldwide. It totaled 20 million units shipped for this quarter and reached 25% of the worldwide smartphone market share. But that's all the droids combined - Apple is the single biggest smartphone manufacturer in the US and has edged out RIM on the international smartphone market with 17% share. Still, RIM is doing quite well - a 412% increase in shipments and 15% worldwide smartphone market share. In Latin America, they are number one - nearly 40% of smartphones there are BlackBerries. Symbian still fuels the majority of smartphones - but since Samsung and Sony Ericsson announced they won't be producing any more Symbian handsets, Nokia is pretty much on its own on this ship now. Interestingly, Symbian is still going strong in Japan (used by Fujitsu and Sharp), but as yesterday's report showed, Japan mostly uses locally made phones. The Nokia N8 is expected to help increase shipments around the holiday season but Symbian is falling and Nokia needs to move with MeeGo, say the analysts. Microsoft already made the jump to their new OS - and their outlook is improving, owing much to heavy integration with other services. But there's a warning - according to the Canalysts, Windows Phone 7 needs to add support for non-roman languages and it needs to do it fast so it can truly realize its potential.